the dog snaps at imaginary flies. We think these spells are a type of seizure. Fly-biting or fly-snapping are terms used to describe peculiar episodes where the dog appears to be snapping at imaginary flies. The episodes tend to occurr sporadically, but in some cases can happen frequently throughout the day. Usually the dog is sitting quietly when the spells begin. They seem to focus on the air around them and snap out several times. Usually this is done with a very "matter-of-fact" attitude, but rarely it is done with more emotion and growling. Very often, the dog will lick at the front limbs as well. The dogs appear to be normally conscious and aware during these episodes and can sometimes be distracted out of the episode by calling their name or throwing a ball for them. Some dogs become upset by the episodes and seek out their owner during them. 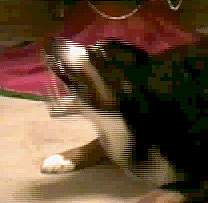 We've included a video segment of a dog having a fly-biting episode. She snaps at the air several times and then licks at her front leg. Notice that she doesn't appear disoriented or upset during the episode. Click here to begin video. This requires Windows Media Player which can be downloaded from Microsoft by clicking here. The fly-biters are still a bit of a question mark for veterinary neurologists. We think they are a type of complex partial seizure, but the evidence is not conclusive. We know that hallucinations can be a manifestation of epilepsy in people. We also know in both people and dogs, seizures can cause isolated movements. Since a dog can't tell us what she sees or feels we don't know for sure whether they are seeing imaginary flies or experiencing involuntary movements when they do their fly-biting. Based on the fly-biters I've observed, my gut feeling is that they are experiencing hallucinations, but there is no way to know for sure. Ideally, a diagnosis of epilepsy would be based on showing abnormalities in the brain waves recorded by an EEG during one of the episodes (see Canine Epilepsy Basics for details on EEG and seizures). This is often much easier said than done even in people much less with dogs. The brain wave abnormalities, like the seizures come and go. For example, I recently recorded an EEG on a dog we know has classic epilepsy and saw nothing unusual. Then right after I stopped recording from him, he had a seizure. If I had recorded him another 5 minutes I would have been able to see the seizure on the EEG, but I missed it. In people, they will record EEGs for days at a time to try to catch an episode. Needles to say, the dogs won't tolerate having to sit still with electrodes stuck on their heads for very long and often we need to sedate them just to record short EEGs. Since we usually can't document the seizure with the EEG, we have to look at the episode and how it responds to medication to decide whether we're dealing with epilepsy or not. Some fly-biters go on to have classic grand-mal type seizures as well. When this happens, it's a good bet that the fly-biting is a manifestation of the seizure disorder. If the dog is only having the fly-biting episodes, then we often rely on response to treatment to help us determine if these spells are seizures or not. We start the dog on a standard dose of antiepileptic medication such as phenobarbital, and see what happens. If the spells stop, that supports the idea that they are indeed seizures. Sometimes the spells are so sporadic, however, that it makes it difficult to tell whether we've affected the frequency or not. Infrequent episodes are unlikely to cause ill effects and should not be a cause for concern unless they become more frequent or are accompanied by grand-mal seizures. What else might cause fly-biting? Eye problems are one possible cause of this behavior. The eye is filled with fluid and sometimes a little chunk of debris will occur in the fluid called a "vitreous floater". People who have these floaters report spots floating before their eyes, and we presume that if a dog saw such a spot, she might snap at them thinking they were flies. Vitreous floaters are visible when you look in the eye with an ophthalmascope (the instrument used to examine the eye). We've looked for them in many, many flybiters and have not found any vitreous floaters. Other diseases can cause people to experience hallucinations. People with migrane headaches report flashes of light or other strange visual sensations before their headache begins. The fly-biters don't appear to be in any pain during or after their episodes, so if it is something akin to migranes in people, it is only the vison changes. Psychotic patients often hallucinate although these often consist more of voices than images. While it is possible that the dogs are hearing rather than seeing imaginary flies, they don't behave abnormally in other respects. Preliminary results from the Canine Epilepsy Project suggest that genetics may play a role in this condition. Several breeds report fly-biting either alone or in combination with grand-mal seizures, while others only report the more classic seizure types. The fly-biting episodes per se do not appear to be serious, but if grand-mal seizures also occur, such seizures can be life threatening. Since the fly-biters seem to represent a distinct group, they could provide clues to the genetics of the more serious seizure disorders in dogs. We would rather not think that there may be a hereditary problem in the breed we love, but unfortunately, hereditary diseases are a fact of life in all dogs. We will never solve the problem of epilepsy unless owners and breeders are courageous enough to face the problem head on. If your dog has "fly-biting" episodes, please participate in the Canine Epilepsy Project to help us determine the nature of this condition.